What is the TomoTherapy® System? Radiation therapy is a non-invasive procedure that uses low doses of radiation to kill cancer cells. It has been successfully used to treat cancer for the past 80 years. The TomoTherapy system is the most advanced radiation delivery system, combining precise 3-D imaging with highly targeted radiation beams delivered with extreme precision to treat cancers throughout the body. TomoTherapy is so precise that it minimizes damage to surrounding tissues, which reduces side effects for patients. Our cancer center in Arizona offers the most advanced radiation treatments in the Phoenix area with the TomoHD system, which combines each patient’s unique treatment plan with precise patient positioning and radiation from an extremely advanced system. Combined with the option of innovative TomoHelical, which has been in use for almost a decade with 360-degree fan-beam radiation delivery, and TomoDirect, a non-rotational radiation delivery option, this sophisticated all-in-one system results in more control and greater accuracy in treating a wide variety of cancers. 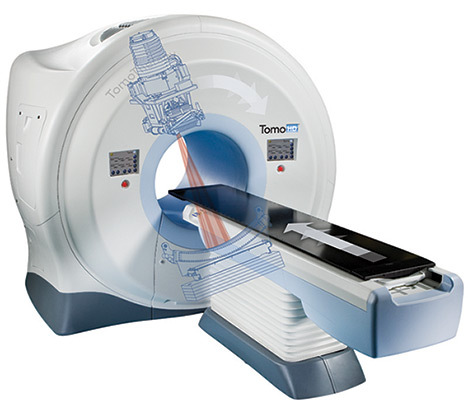 In addition, the TomoTherapy system utilizes CTrue technology. CTrue images are critical in patient set-up, positioning and managing any movement by the patient during treatment. CTrue enables clinicians to see where the anatomy is compared to where it’s supposed to be, based on accurate, consistent 3-D images. 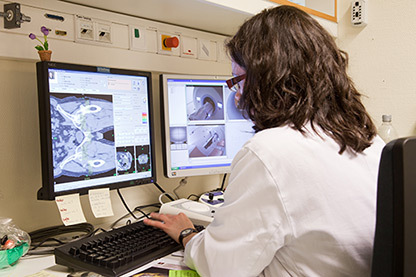 Clinicians can quickly determine during treatment if adjustments of the patient are required to ensure that radiation is delivered precisely to the target. TomoThereapy is successful in treating a variety of cancers including breast, prostate, lung and chest, head and neck, brain, primary and metastatic tumors and spinal lesions. Before beginning TomoTherapy treatment, a board certified radiation oncologist puts together each patient’s unique treatment plan using 3-D images from a combination of scanning technologies and special software to establish the precise contours for each tumor and surrounding sensitive organs or tissues. Our cancer doctor then prescribes how much radiation the tumor should receive, as well as acceptable levels for healthy tissue nearby. Many patients who have reached their max tolerance dose of traditional radiation may be a candidate for TomoTherapy radiation. A typical course of radiation therapy involves a daily process, Monday through Friday. The number of treatments varies by case. On average, the daily TomoTherapy procedure takes 20 minutes from the time the patient enters the treatment room. This includes about five minutes for the daily CT, patient set-up and another five minutes for treatment delivery. At our center when you check in, you will be taken to a treatment room. Our radiation therapist will help you lie on the comfortable couch and may fit you with a special device. During treatments, daily low-dose CT imaging helps us know that radiation is reaching the tumor as your doctor planned, and that exposure to healthy tissue is minimized along the way. TomoTherapy treatments are completely painless. The experience is similar to having a CT scan or an X-ray taken. You may hear a clicking noise and the hum of the machine, both of which are normal. Tomotherapy is offered at our Scottsdale location. Click here for more details. To find out if TomoTherapy treatments are right for you, contact the Palo Verde Cancer Center Scottsdale today, (480) 941-1211.